Seems we are in the bundle season. In case you are not familiar with it, the indie application bundles are one of the great advantages of the Mac software ecosystem. You can frequently purchase a bundle of great applications at 80% and 90% discount regarding their normal resale price. Some of these applications are live savers and others are just great productivity enhancers. The Macupdate bundle has Data Rescue 3 of which i already wrote here. In short, it’s a great data rescue app and it saved my royal bacon when no other application seemed that could do it. 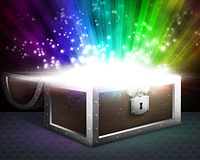 So if you need a data rescue app or want to have one just in case, now is your chance, as even if you bought the full bundle you would already saved 50% of the normal resale price. The other apps are just meh… For Concealer for example, you can either just do the same using a Disk Utility encrypted sparse-bundle image (( which i do for example to store receipts, serial numbers and other info)) or it’s already done naturally by the Mac OS Keychain. And if you purchased another Mac application bundles in the recent past you probably have some equivalent of most of the other apps. The only one that stands in the crowd is Printopia, which allows for iOS devices to use any printers available in the house. Although i have a license for it, i lack any experience with it (( i keep waiting for a payola iPhone from Apple PR department but it never seems to find my way…)) but the general feedback on it seems to be rather good. 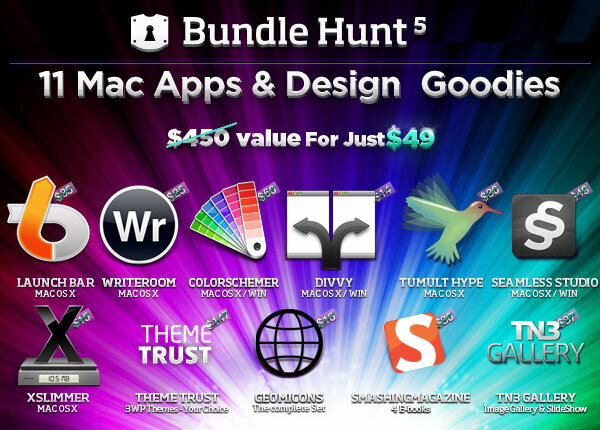 A much more atractive bundle seems to be BundleHunt. (( this is an affiliate link. If you purchase a bundle, part of it will end helping to pay this website hosting costs. It wont make say anything i don’t agree with though. The hosting costs aren’t that high… )) From it i already have Launchbar and WriteRoom. And i love both of them. Writeroom is very easy to explain. It turns your computer in a two color retro screen for distraction free writing. If you need to do serious writing and everything around you is distracting, Writeroom is the answer. My mac instantly turns in a green on black screen with a blinking cursor; and it’s Heaven! Launchbar however is more complicated. It’s a launcher, in the same way as Quicksilver or Alfred. But at the same time is much much more… The interface could use some improvements, but basically you would could do everything that you would usually do on you Mac on/by it; simply by using the keyboard which is faster and less error prone than the mouse. Launch an app; open files; send them to the Mail app or a contact on your address book; open a website; search in google; send any data, either text, files or clipboard content to any other app; open most apps recent documents; browse your disk (and see the invisible folders if you want); and much much more… I admit, it took me a couple of months until i understood the potential of the app. And a couple of web tutorials to realize it. But if you have the chance to purchase it, go for it. From the other apps Colorschemer seems great for any web or document design. Matching colors, and the family of colors that you can use in a document without it appearing a garish rainbow from hell is a strong plus on your presentation skills. In fairness though you can get a similar function at colorschemedesigner.com but i assume the native app probably has more content and functionalities. Haven’t tried it yet. Divvy is a usual on other websites recommendations. Hype is a fairly new HTML5 web design app but it has garnished very good reviews. There’s more apps on the bundle but you should check it out for yourself as they fall out of my natural software usage and so, I can’t really assess their usefulness. Personally, what would interest me in the bundle would be the 3 ThemeTrust WordPress themes of my choosing for a redesign of other of my web projects as i already have some of the other applications. But this bundle seems a good one so evaluate if the software on it has any interest for you. You probably won’t have the chance to buy it this cheap so soon. You can regularly find the current Mac bundles at Squidoo and i recommend you keep it in your bookmarks and check it monthly. Sometimes you can get great value for 2 or 3 apps that you already wanted but weren’t ready to pay full price for them. ““What is Google? What do they sell?” asks Don Norman, the author of The Design of Everyday Things and a demigod of the design world. The truth is they always have been. Maybe we just didn’t noticed before. And many people still don’t notice it. I notice it every time i have to spend endless hours fixing somebody else broken Windows and removing crapware (not entirely unrelated…) as a personal favour. And every time i think that i should just charge them for making stupid purchases because they are apparently “cheap”. The fact is they aren’t. They usually broke down not even after 2 years, they lose keyboard keys or the wireless stops working after 12 months, the dvd player/recorder dies after you’ve used it around 100 times and in the general the whole thing is just a piece of crap. If you try to service it by changing the RAM parts or cleaning the fan, prepare for endless screws, plastic attachments that are nowhere to be seen and basically just a whole jig-saw experience with endless black plastic parts. If for nothing else this should just warrant them a nice “Devil’s Island” style tour to Antarctica or some island near the North Pole. Been patiently waiting for months for this CD. Even restrained myself from buying the digital so that i wouldn’t get two editions when the CD came out.